Check out this pamphlet (there’s a post about it at suffrageandthemedia.org and a copy of the actual pamphlet is below). 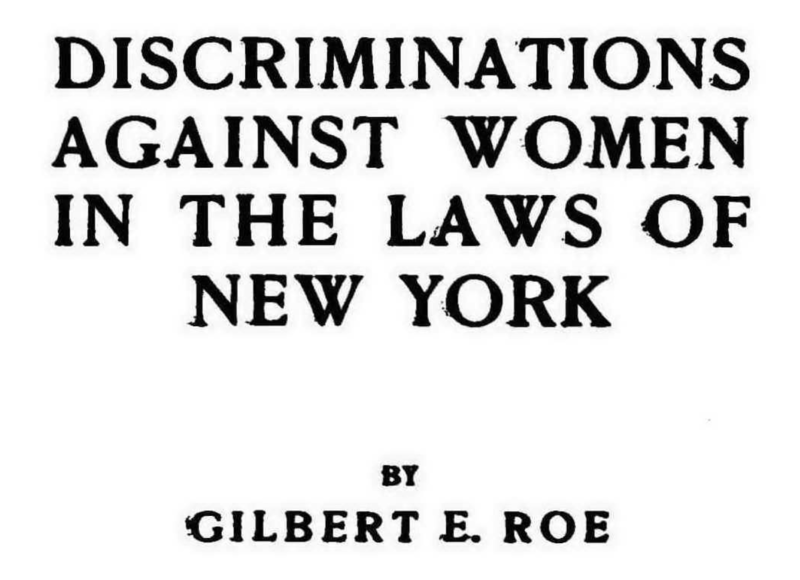 It was the published version of a 1914 address by the New York attorney, Gilbert E. Roe, enumerating the 15 ways the laws of New York at the time discriminated against women. Roe was a member of the Men’s League for Woman Suffrage and one of a sizable number of suffragent judges and attorneys, among them, Samuel Untermyer, Dudley Field Malone, and George Gordon Battle. Malone and Battle would represent Alice Paul and her jailed National Woman’s Party colleagues after their arrest and incarceration for protest demonstrations at the White House.